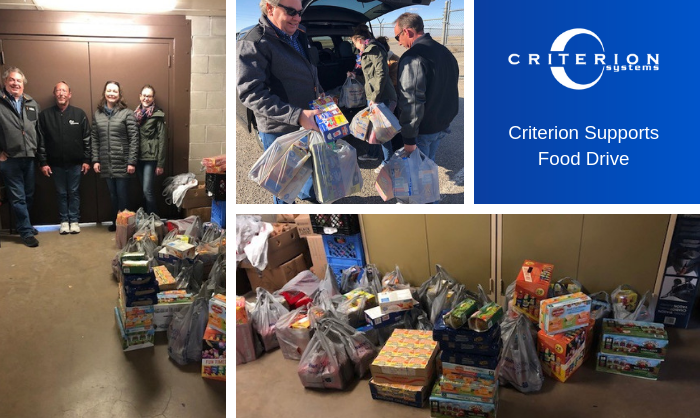 Criterion employees in Albuquerque recently participated in food drive organized by the Kirtland Air Force Base (KAFB) Security Forces, called Feed the Kids. The mission of the drive is to provide food to 75 at-risk children that attend Wherry Elementary and ensure they have enough to eat while outside of school. With the food donations from Criterion the KAFB Security Forces were able to almost double the amount of food they have on hand for the rest of the school year. Children should not go hungry. Of the children that receive assistance from this program many are recent immigrants and live in one of the worst areas of Albuquerque as far as crime and education opportunities. Wherry Elementary is making great strides in supporting the students’ education but is not able to provide for their needs outside of school and being hungry affects every aspect of a child’s life and can have long term effects including nutritional deficiencies, stunted growth and overall healthy relationships with food (i.e., eating disorders, hoarding, etc.). The food drive is ongoing throughout the year so there will be more opportunities to support the kids of Wherry Elementary.